This article is about the baseball player. For the Ohio author, see Addison Peale Russell. For the Connecticut politician, see Charles Addison Russell. 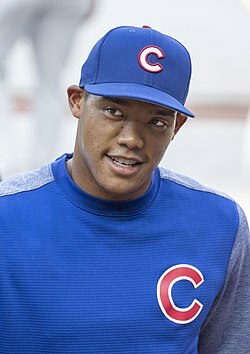 Addison Wayne Russell (born January 23, 1994) is an American professional baseball shortstop for the Chicago Cubs of Major League Baseball (MLB). In 2015, Baseball America listed Russell as the third-best prospect in professional baseball. He made his MLB debut in April 2015 and was an All-Star in 2016. Russell attended Pace High School in Florida and in 2010 led his high school to a class 5A FHSAA baseball state championship and a runner-up finish in 2012. Russell played in the 2010 Under Armour All-America Baseball Game, was named a Perfect Game Aflac All-American Game participant and a Louisville Slugger First Team All-American in 2011. He was also ranked as the No. 18 high school prospect by Baseball America and as the No. 24 high school prospect by Perfect Game. In his final high school baseball season, Russell hit for a .368 batting average and recorded a .532 on base percentage. Russell also played high school football at the running back position. In November 2011, Russell signed a National Letter of Intent to play college baseball at Auburn University for the Tigers baseball team. Russell was a member of the USA Baseball 18U National Team at the 2011 COPABE 18U/AAA Pan American games that won a gold medal. At the tournament, Russell batted .393, going 11-for-28 with three doubles, a triple and a home run, driving in nine RBIs and scoring 11 runs. During the championship game against Team Canada, Russell hit a grand slam and was named First-Team All Tournament as Shortstop for his efforts. At the tournament for Team USA, Russell played alongside future professional baseball players Albert Almora, Alex Bregman, David Dahl, Joey Gallo, and Carson Kelly. Russell was drafted by the Oakland Athletics with the 11th overall pick of the first round in the 2012 Major League Baseball Draft out of Pace High School in Pace, Florida. Russell received a $2.625 million signing bonus for signing with the A's instead of attending Auburn. He was also the first high school athlete selected by the A's in the first round of the draft since Jeremy Bonderman in 2001. Russell started his career with the Arizona League Athletics, where he hit .415/.488/.717 with six home runs and 29 runs batted in in 26 games. He was then promoted to the Vermont Lake Monsters and hit .340/.386/.509 with one home run in 13 games. He finished the season with the Class-A Burlington Bees, hitting .310/.369/.448 in 16 games. Overall, he finished his first season hitting .369/.432/.594 with seven home runs and 45 runs batted in 55 games. In 2012, he was named an Oakland MILB.com organization All-Star and an AZL post-season All-Star. Prior to the 2013 season, Russell was the Athletics' best prospect according to Baseball America. He was also named the best prospect in the Arizona League. In 2013, he was named an Oakland MILB.com organization All-Star, a CAL rookie of the year, a CAL post-season All-Star, and a CAL Futures Game selection. Playing for Mesa, he was also named to the AFL All-Prospect Team, and an AFL Rising Star. On July 4, 2014, Russell, along with pitcher Dan Straily, outfielder Billy McKinney, and a player to be named later, was traded to the Chicago Cubs in exchange for pitcher Jason Hammel and pitcher Jeff Samardzija. The Cubs sent Russell to the Arizona Fall League for the second time at the end of the 2014 minor league season. Baseball America named him the #3 prospect before the 2015 season. On April 21, Russell was called up to the 25-man roster to play second base against the Pittsburgh Pirates at PNC Park. On May 1, Russell hit his first career home run off of Wily Peralta in a 1–0 victory over the Milwaukee Brewers. He moved to his normal infield position at shortstop in early August, replacing three-time All-Star Starlin Castro. Russell committed only two errors in 52 games as the regular Cubs shortstop. In the 2015 postseason, he had 3 hits in 12 at bats with 1 RBI. Cardinal Pitcher John Lackey had a no-hitter into the sixth. Russell's single was the first hit. He hit a triple in the late innings of the third NLDS game and was slightly injured sliding into third. He did not play in game four. After the Cubs defeated the Cardinals in the NLDS to advance to the NLCS to face the New York Mets, it was announced that Russell had pulled his hamstring. This injury kept him out of the NLCS. After the season, the Cubs acquired Jason Heyward. Russell gave up his jersey number, 22, to Heyward, and switched to number 27 in honor of Eddie George. Batting .242 with 11 home runs and 48 RBIs, Russell was the starting shortstop at the 2016 Major League Baseball All-Star Game. By the beginning of September of the 2016 season, Russell had 108 hits in 445 at bats with 19 home runs and 88 runs batted in. Russell had a bases-loaded game-winning hit in a late-season game against the San Francisco Giants. He was 9-for-23 (.391) with 24 RBIs in bases-loaded situations for the year; the 9 bases-loaded hits led MLB for the season. In the seventh inning of the same game, in a bases loaded situation, Russell made an acrobatic catch at the left field foul line for the final out of the inning. Russell finished the year with 95 RBIs and became the second Cub shortstop with over 90 for a season. Previously, Hall of Famer Ernie Banks accomplished this feat five times. Russell hit decisive two-run home runs in Games 4 and 5 of that year's National League Championship Series, helping the Cubs break the Curse of the Billy Goat en route to their first World Series appearance in 108 years. On October 25, 2016, Addison Russell along with teammates Dexter Fowler, Jason Heyward, and Carl Edwards Jr., became the first African-Americans to play for the Cubs in a World Series game. Both Russell and Fowler are the first African-Americans to start for the Cubs in a World Series due to it being the first World Series the Cubs have played in since desegregation. [a] Addison hit the 19th grand slam in the history of the World Series in the sixth game and also tied an MLB record of 6 RBI by one player in a game on a team facing elimination from the fall classic. He is the first player of Filipino-American descent to hit a grand slam in a World Series game. It was the first World Series grand slam since Paul Konerko of the Chicago White Sox in the 2005 World Series. On April 19, 2017, Russell hit his first career walk-off home run, a three-run shot against the Milwaukee Brewers. On August 4, Russell was placed on the 10-day disabled list due to a strained right foot. At that point in the season his batting average was .241 with 10 home runs and 36 RBI's. Russell had a disappointing season, and he did not play again after September 19 due to the MLB placing him on administrative leave as it investigated abuse allegations made against him by his ex-wife. Russell will be suspended for the first 29 games of the season, finishing the 40-game suspension he received in 2018 as a result of allegations, found credible by MLB, that he abused his wife. Russell and his wife separated after the accusation surfaced. Russell did not appeal the suspension. Russell has a daughter named Mila, born in May 2015. Mila's mother is Mallory Engstrom. Russell and Melisa Reidy married in January 2016 and have a son, Aiden, born in August 2015. In June 2017, Russell was accused, by an unknown party, of domestic violence against Reidy, an incident which led to Reidy filing for divorce. Although the unknown poster has been identified in media reports as a "third party", at least one media outlet reported speculation that the poster was Reidy herself. Two weeks after this initial allegation, Reidy's lawyer said that she would not be cooperating with MLB's investigation and that she "isn't interested in legitimizing anything that doesn’t come from her." Ultimately, Reidy did meet with MLB, once she felt strong enough to do so. MLB suspended Russell for 40 games as a result of its investigation. Russell chose "Addy" as his nickname for the Players Weekend during the 2017 and 2018 seasons. ^ LeRoy, Oscar (April 2, 2014). "Rising star Russell ready to show skills in Midland". Midland Reporter Telegram. Retrieved February 27, 2014. ^ Marshall, Ashley (April 21, 2015). "Cubs call up No. 2 prospect Russell". MILB.com. Retrieved February 27, 2016. ^ Muskat, Carrie (May 7, 2016). "Russell admires the strong women in his life". MLB.com. Retrieved May 31, 2016. ^ Nightengale, Bob (February 9, 2017). "After greatest year of his life, Cubs star Addison Russell vows to stay humble". USA Today. Retrieved December 31, 2017. ^ a b c d "Eight things to know about Cubs mega-prospect Addison Russell". Chicago Sun Times. April 21, 2015. Archived from the original on December 22, 2015. Retrieved December 21, 2015. ^ Crasnick, Jerry (February 26, 2016). "Cubs convinced Addison Russell will thrive at shortstop". ESPN. Retrieved August 5, 2016. ^ a b "A's nab high school infielder Russell at No. 11". Oakland Athletics. Retrieved April 26, 2015. ^ a b c Ostler, Scott (February 25, 2014). "Shortstop Russell is taking fast track to big leagues". San Francisco Chronicle. Retrieved December 21, 2015. ^ a b c "BASEBALL SIGNEES DAHL AND RUSSELL WIN GOLD WITH USA BASEBALL 18U TEAM". Auburn Athletics. December 11, 2011. Retrieved December 19, 2015. ^ a b "USA tops Canada, 12-2; wins gold". USA Baseball. November 27, 2011. Archived from the original on December 22, 2015. Retrieved December 21, 2015. ^ a b c "Addison Russell Stats, Video Highlights, Photos, Bio". Chicago Cubs. ^ "Addison Russell, SS, Cubs". Baseball America. Retrieved May 10, 2015. ^ "BaseballAmerica.com: Prospects: Rankings: League Top 20 Prospects: 2012 AZL Top 20 Prospects". baseballamerica.com. September 24, 2012. Retrieved April 26, 2015. ^ "Cal League reveals awards, All-Stars". MILB.com. August 23, 2013. Retrieved February 27, 2016. ^ Berra, Lindsay (July 14, 2013). "Russell, Ynoa represent A's in Futures Game". MLB.com. Retrieved February 27, 2016. ^ Callis, Jim (October 27, 2014). "Cubs Arizona Fall League overview". MLB.com. Retrieved February 27, 2016. ^ "2015 Top 100 Prospects". Baseball America. February 20, 2015. ^ Heyman, Jon (April 20, 2015). "Cubs call up infield prodigy Addison Russell to majors". CBSSPORTS.com. Retrieved April 21, 2015. ^ Tayler, Jon (April 20, 2015). "Cubs' future grows brighter with call-up of top prospect Addison Russell". SI.com. Retrieved April 21, 2015. ^ Snyder, Matt. "Russell's first career HR lifts Cubs 1-0 over Brewers". CBS Sports. Retrieved May 1, 2015. ^ Gonzales, Mark (October 5, 2015). "At 21, Cubs shortstop Addison Russell is a true student of the game". Chicago Tribune. Retrieved October 14, 2015. ^ Thele, Kyle (December 16, 2015). "Cubs' Addison Russell flipping number from 22 to 27". Chicago Sun Times. Archived from the original on July 6, 2017. Retrieved December 21, 2015. ^ Castrovince, Anthony (July 5, 2016). "All-Star rosters packed with dynamic talent". MLB.com. Major League Baseball Advanced Media. Retrieved July 5, 2016. ^ Mooney, Patrick (September 1, 2016). "Cubs could have a new Mr. October coming in Addison Russell". csnchicago.com. CSN Chicago. Archived from the original on August 5, 2017. Retrieved September 2, 2016. ^ "Batting Event Finder — Addison Russell: 2016, Plate Appearances, With Runners on 123". Baseball Reference. Retrieved July 13, 2018. ^ "Team Batting Event Finder: 2016, All Teams, Hits, With Runners on 123". Baseball Reference. Retrieved July 13, 2018. ^ Muskat, Carrie. "Pitt stop: Russell's great grab key for Cubs". mlb.com. MLB.com. Retrieved September 2, 2016. ^ "2016 National League Championship Series (NLCS) Game 4, Cubs at Dodgers, October 19". Baseball Reference. Baseball Info Solutions. Retrieved June 12, 2018. ^ "2016 National League Championship Series (NLCS) Game 5, Cubs at Dodgers, October 20". Baseball Reference. Baseball Info Solutions. Retrieved June 12, 2018. ^ Collier, Jamal (October 25, 2016). "Fowler Cubs' first African-American in Series: Center fielder will be first up in Game 1; Heyward, Edwards, Russell also honored by distinction". mlb.com. Retrieved October 25, 2016. ^ Muskat, Carrie (October 25, 2016). "Cubs set roster for World Series vs. Indians: Schwarber returns after missing nearly all of season with knee injuries". mlb.com. Retrieved October 26, 2016. ^ "Box Score: Game 1, 2016 World Series". Gameday. mlb.com. October 25, 2016. Retrieved October 26, 2016. ^ Muskat, Carrie; McCalvy, Adam. "Cubs rally late with Russell's walk-off homer". MLB. Retrieved April 19, 2017. ^ "Addison Russell goes on disabled list with strained foot". ESPN. Retrieved August 4, 2017. ^ "No Timetable on Finishing Addison Russell Investigation, MLB Commissioner Says". NBC Chicago. Retrieved October 3, 2018. ^ Crasnick, Jerry (February 26, 2016). "Cubs convinced Addison Russell will thrive at shortstop". ESPN.com. Retrieved February 27, 2016. ^ "MLB investigating domestic violence accusation against Addison Russell". ESPN. June 8, 2017. Retrieved June 8, 2017. ^ "Addison Russell's wife says she won't speak with MLB investigators". USAToday. June 21, 2017. Retrieved May 24, 2018. Wikimedia Commons has media related to Addison Russell.